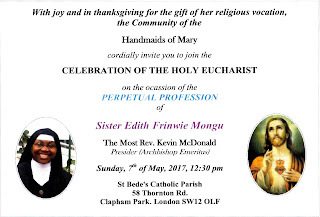 Final Profession of Sister Edith - Today at 12.30pm: Today at 12.30 Archbishop Kevin McDonald (who was at Southwark from 2003 – 2010) is coming to preside at the Special Mass of Profession. 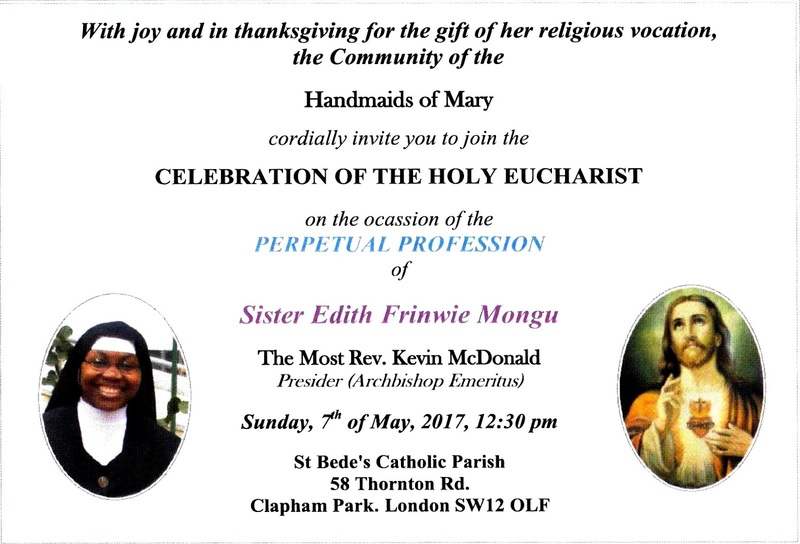 Sister Edith (originally from the Cameroons like Sister Patricia) will make her profession to Mother Provincial from Madrid. We pray that the counsel of poverty will enrich her; the counsel of chastity will envelop her with the love of God and the counsel of obedience will liberate her from all enslavement! She will receive the ring as a Bride of Christ. Religious sisters complement most beautifully the ministry of the ordained priests. Unlike the men whose ministry is cultic, the ministry of a consecrated woman is prophetic and open to a whole variety of apostolates. Like St John the Baptist, a consecrated religious is a signpost in the jungle of this confusing world. We are so blessed to have our 10 Handmaids of Mary who minister to the sick. We are especially appreciative of Sister Carmen who visits over 60 housebound every week and has given solace to the dying and their families. We thank God for this profession today and pray for more vocations! Welcome to Fr Jim Hurley: who is the Episcopal Vicar for Religious for our Diocese. He was here last for the centenary of our nuns coming to London from Madrid in 1912. Archbishop Peter Smith came for that Mass. Today he is here for the profession of Sister Edith and yesterday said Mass for our 3 Franciscan sisters. They have some benefactors but they need a roof over their head. Wouldn’t it be wonderful if they could stay in this parish area? Do you know of any house that is empty? They would look after it beautifully. Fr Pawel: is in Poland and doing exams on Monday / Tuesday – prayers please! He will be back on Thursday. May Procession - Next Saturday: To celebrate the 100th anniversary of Our Lady of Fatima; the May procession will take place on Saturday 13th May at 10am. We will leave St Bede’s and go to the convent where we will bless their statue and process back towards the church. There will be a shared lunch in the club afterwards. May Procession at St Bernadette School: Tuesday 16th May at 10am. Congratulations to St Bernadette School: on their recent Section 48 Inspection by the Diocese. They received a rating of “Outstanding” across all areas. Well done to Mrs Hogan & all the staff. 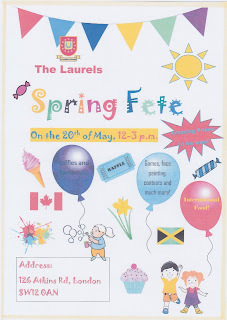 The Laurels Spring Fete: Saturday 20th May 12-3pm. There will be raffles, tombola (for adults & children), games, face printing & international food (very popular !!). Couple looking for accommodation: in local area. Please see fr CB if you have any ideas. Welcome to God's Church: Samuel Arthur Gyesi, son of Samuel & Benedicta baptised last weekend by Fr Lukasz. Cleaners for this week: Vicki Sabatini & Fernanda Rodrigues.